All Saints’ math, science and technology teachers work together to ensure that, at all grade levels, All Saints’ students practice STEM and STEAM. Presented with a problem to solve, students brainstorm in small groups, using their science, math, and technology skills, to design and engineer a solution to the problem. They test their design, and, if necessary, re-engineer it before presenting their solution to their classmates. STEM education is not only fun for students, but it also teaches them the importance and value of creativity, collaboration, flexibility, and communication, important traits for 21st-century citizens. 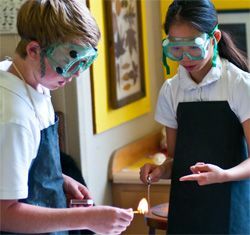 Science at all levels in grades 6 – 8 emphasizes critical thinking, problem-solving, and lab skills. The sixth-grade curriculum focuses on earth sciences but also includes units on physical science and life science. The oceans provide much of the focus for our studies. Students investigate the ocean floor, plate tectonics, and the earth’s structure. They also explore the physical characteristics of oceans, including temperature, salinity, and tides. As part of the All Saints’ science curriculum, sixth graders attend SEA Lab camp in the fall semester as part of the environmental education curriculum, which encourages a deeper understanding of our coasts and ocean and the importance of being stewards for the ocean. Seventh-grade science focuses on life sciences but also includes units on earth science and physical science. Throughout the year students study ecology, the physics of light and lenses and the physiology of eyes. Students are introduced to chemistry, which includes the organization of the Periodic Table and the role that the elements play in living systems. As part of the All Saints’ science curriculum, seventh graders spend a week of environmental education each spring at the Headlands Institute in Marin, where the emphasis is on the geology of the Headlands, coastal hill ecology, and stewardship. Eighth-grade science focuses on physical sciences but also includes units on earth science and life science. Physical science emphasizes Newtonian physics and chemical reactions, and life science includes the evolution of life on earth. Eighth graders extend their study of chemistry begun in seventh grade by investigating chemical reactions this year. In life science, they focus on the evolution of the earth including natural selection, adaptations for survival, and animal classification. Earth science includes a unit on astronomy, with an emphasis on the origin and structure of the universe. As part of the All Saints’ science curriculum, students spend a week of environmental education at the Yosemite Institute in February. Our 8th grade students compete in the National Science Fair each year. We are very proud of our students' achievements each year! 5 First place finishes, 6 Second place finishes, and 1 Third place finish! The seven first place winners (Adam Chaabane, Graziella Cosentino, Kevin Daliri, Angelo Giangiorgi, Joelle Mundo, Ivor Myers, and Pierce Nelson) represented All Saints' and Monterey County at the California State Science Fair on April 24-25 in Los Angeles. Click here for an interesting article about why Science Fairs are so important and on the rise.